Today we share Rehanaben’s story with you. She has been working with us for ten years now. She was involved in several programmes like the Balghars, Micro-finance and Samvad Community Video Unit. Read about her inspiring life story below! Rehanaben was born in 1978 in Behrampura area of Ahmedabad. Her father, the sole bread earner of a family of nine, stopped earning after Rehanaben’s elder sister succumbed to injuries of an accident. The burden of nurturing and bread earning for her family then fell upon her mother and her elder brothers, both of whom had to drop out of their high school education. Rehanaben struggled hard to complete her schooling. She sold toffees to her school mates and earned income to carry out the expenses of her school fees. Her struggle to pursue education continued with her aspirations of graduating and post graduating. Rehanaben came across SAATH when after the 2002 riots SAATH began its relief work in Behrampura relief camps to encourage residents there to get back to their routine and support their lives by generating income streams. Being good at academics, Rehanaben considered joining the Balghar program (pre-school) run by SAATH in the relief camps where she used to teach children and started earning an income of INR 2000 every month. This apart, Rehanaben also spearheaded the task of establishing a Micro Finance Institute in Behrampura. So dedicated was she towards her work that SAATH decided to carry out the daily operations of its Micro Finance Institute from her house in its initial days. In a span of two years, Rehanaben was able to have more than 600 families in the Behrampura area enroll with the MFI and start saving on a regular basis and beginning with microloans gradually. 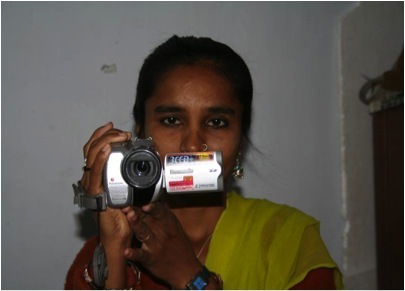 While Rehanaben continued rendering her services to the MFI, SAATH came up with the concept of using documentary films produced and acted in by the community members to express their concerns over socio-economic occlusions in the community, known as SAMVAD. Initially when asked to join SAMVAD, Rehanaben was reluctant for two reasons; first, she lacked confidence in terms of producing a film and second, she did not want to give up on the hard work that she had put on in establishing an MFI in Behrampura. However, once she started producing films, she came up with brilliant ideas that brought about considerable changes in the community. She describes two instances when she herself had to change to convince community through documentaries produced by her. One of them was when the SAMVAD unit was up for shooting against the Addiction of Tobacco in the community. Rehanaben was reluctant in shooting this film since she too had the same habit. It took her three months to get rid of the addiction which had been with her for quite long .Only then did she produce the film and was so convincing in the film that many youth took an inspiration from this and gave up on their addictions as well. Another path-breaking documentary that Rehanaben and her team made was on the Issue of Adulteration in Ration Shops. This was particularly a challenge for her since she belonged to a family of ration shop owners and the film was to be featured on her own uncles. However, she did not deter from bringing out the grievances of the community and shot the film. So compelling and eye opening was the outcome that the shop owners had to concede to fair selling practices after the screening of the film. After serving in SAMVAD for three years, Rehanaben got back to the MFI operations in 2009 as it was the work that she had always admired and wanted to be associated with. Presently, she is placed as the Branch Manager of Sankalitnagar Branch of The SAATH Savings and Credit Co-operative Society. She describes being associated with SAATH as a major change in her life. “I had no knowledge on computers. It was in SAATH that I learnt many new technologies and also produced films” says an overwhelmed Rehanaben. Rehanaben has been a paragon for most youth in Behrampura slums. Her undying valor and courage to step out of the confined four walls of the house confidently for serving across communities, has set up an example for many families, who now send their daughters to school and expect them to be self reliant like Rehanaben. Rehanaben is the face of Behrampura and will inspire people there to move ahead with their aspirations no matter what comes their way to make their lifestyles better and uplift the area.